It’s 8 o’clock in the morning and I’m completely covered in hay. Tiny pieces of it have infiltrated every piece of my clothing, become entwined in my hair, and unbeknownst to me, taken up residence in the top of my wool hat. The tractor pulling the flatbed trailer I’m sitting on lurches forward — slowly — but it’s enough to get the attention of the 200-plus horses that call the C Lazy U Ranch in Grand County home. It’s feeding time at the historic Colorado dude ranch, and as a guest at the ranch, I’ve been invited to brave the cold for a glimpse of what ranch life is really like. As our tractor-drawn trailer crawls through the vast pasture which is part of a picture-perfect landscape framed by rolling hills and anchored with stunning views of the Indian Peaks in the distance, the hungry horses begin falling in line behind us. One by one, they take their place along the trail of hay stretching out behind the trailer. Even Petey the donkey pushes his way through the crowd of horses to get his breakfast. 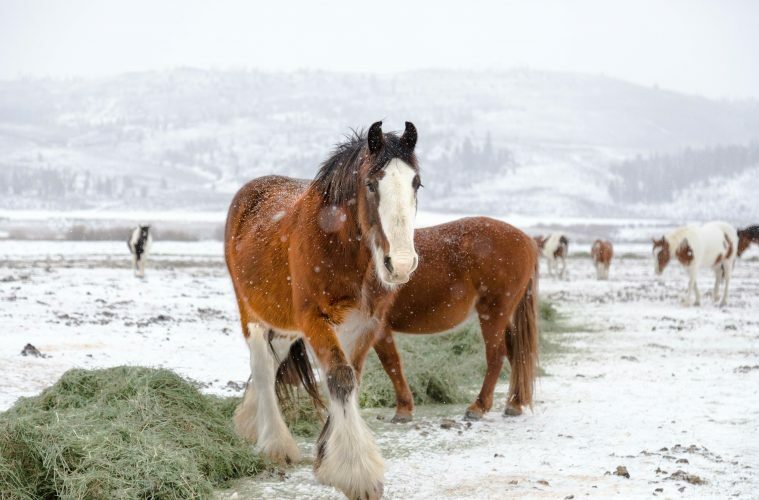 As the snow gently trickles down from the sky, through the soft plumes of smoke from fireplaces all around the ranch, and over the brown, white, black and gray hues glistening horse hair, it’s easy to see why the ranch is such a popular destination for travelers looking to get away. Only the sound of the tractor pulling us back to main lodge pierces the silence brought on by the winter storm. At breakfast, I’m still brushing hay off of myself as I inhale the hearty meal and get ready for the rest of the days activities. Exploring the ranch’s trails by snowshoe is up first, followed by a crash course in BB guns and archery. A happy horse lets off a cry in the distance as I finish my own breakfast — eager and willing to step back in time and enjoy the slow and steady pace of life on a dude ranch.